The Washington Capitals entered Saturday night’s matchup with Columbus with a chance to close out a five-game homestand — one that was disappointing on many levels — on a positive note and head out on a swing of Western Canada (followed by the armpit of America) with an upbeat attitude. The Blue Jackets served the perfect foil in order to for the Caps to regain confidence, as the home team shook up some lines and pairing and came away with a convincing 4-1 win. 1) Martin Erat: 3 assists, +2 in 17:49 on 22 shifts. Enough said. 2) Wait, not enough said. Troy Brouwer and Brooks Laich, playing aside the aforementioned Erat, both had goals as well. 3) Marcus Johansson, who has taken a lot of grief in this space, probably played his best game of the season, recording four shots on goal and generally looking involved whenever he was on the ice, and he assisted on Joel Ward’s power play goal in the spot normally occupied by Mikhail Grabovski (and Mike Ribeiro before him). 4) Braden Holtby continues to work in a groove, knocking away 37 or the 38 shots he faced from Columbus. He had a tough time of it in his first few games, but Holtby’s starting to show the form that could very well earn him a spot on Team Canada come February. 5) Washington has scored a power-play goal in five of their eight games this season and scored multiple power-play goals in four of its eight games this season. Alex Ovechkin has scored a power-play goal in four of Washington’s eight games this season. Seven of Ovechkin’s 10 points this season have been earned on the power-play. Both of Joel Ward’s goals this season have come on the power play. Each of Mike Green’s five points this season have come on the power play. Six of Nick Backstrom’s nine point and three of Marcus Johansson’s six point have come on the power play. All of these stat nuggets came directly from the Caps “Player Notes” bullet points from their post-game Notes and Quotes sheet, but that makes them no less poignant. 3-5-0 isn’t the greatest start to the season, but it sure beats 2-6-0, which would have been fairly miserable considering the Caps now head out for their geographically longest roadie of the season: Winnipeg, Edmonton, Calgary, Vancouver and Philadelphia. On these types of trips, usually you hope to break even and make hay once you get back home. Washington doesn’t really have that luxury anymore and they really need to come out of this trip with at least six points against some of the softer teams in the Western Conference and the woeful Flyers, who with two measly points are currently looking up at the entire league. 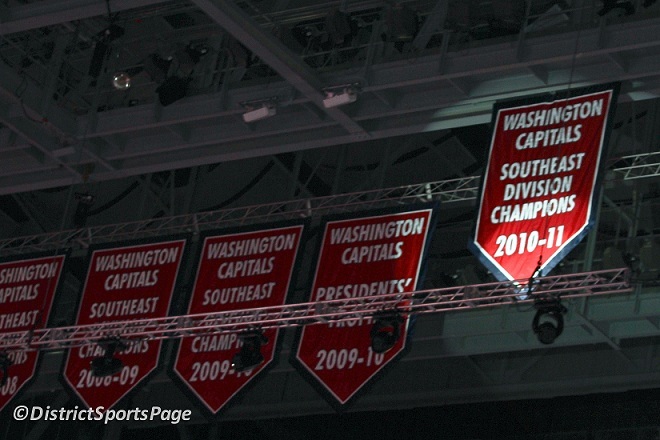 What makes the Capitals a different team on the road? The Washington Capitals are 11-5-1 (23 out of a possible 34 points) at home this season in the comfy confines of Verizon Center. Extrapolated over an 82-game schedule, that translates into an 111-point pace. Only three teams in the Eastern Conference have fewer home losses than the Capitals. They score 3.23 goals per game at home, good enough to be in the top half-dozen in the league, and hit on the power play at a 22.6 percent clip (14-for-62), good for third overall in the NHL. At home, they are — for the most part — the same old Caps we’ve come to know and love during the Ovechkin era. When travelling, however, the Caps are worse than pedestrian; they’re downright bad. At 6-10-1 so far (53-point pace), they have the second most road losses in the East. They’re averaging 2.58 goals per game away from Verizon Center, in the lower third of the league. Their road power play is an atrocious 7-for-61 this season (11.5 percent), ahead of only four teams in the entire league. The dichotomy detailed in these numbers are staggering. They are half the team on the road than they are at home. What could possibly be the cause? If Caps fans want to take a “glass half-full” outlook to the rest of the season, maybe that’s where the silver lining can be found. If coach Dale Hunter can figure out how to shake the malaise from his charges’ road game, and find some semblance of competitiveness while travelling, there’s hope yet for the remaining 48 regular season games. Perhaps that comes with one of the goalies getting hot and stealing a game here and there for the Caps, something that really hasn’t happened since the first seven games of the season. Both goalies are capable of it, but so far this season neither have seized the opportunity when given the chance. Tomas Vokoun, the veteran, expressed frustration the other day when notified he wasn’t starting for the fourth straight game, then played relatively well when called upon to bail out Michal Neuvirth when the youngster coughed up three goals on Buffalo’s first six shots. It’s hard to fault Neuvy for any of the goals really. But sometimes your goalie just has to make a save for you, especially at the beginning of the game when you give up a power play seven seconds in. That, obviously, didn’t happen. Defenseman Karl Alzner spoke — once again — about the bad habits the Caps fall back into when they travel or when they get down early. It’s not fun to watch, either, Karl. As I pointed out in a column last week, the Capitals’ biggest opponent this year has been themselves. They are the same players they’ve always been. They own the same skill sets. The organization was universally lauded for their off-season moves. They won their first seven games of the season, including destroying a very good Detroit team. On paper, this team has the talent, experience and depth to be a very strong contender. But they don’t play hockey on paper. They play hockey on ice, both at home and on the road. Until they figure out how to play better on road ice, it’s going to be tough to gain points in the standings. It’s difficult to put a string of wins together if every other game is going to be another negative reinforcement, as last night’s debacle was. ***Quotes for this story were pulled from published sources. WASHINGTON, DC — Before a crazed, capacity crowd at Verizon Center, the Washington Capitals finally found a lead they could hold onto, as defenseman Mike Green scored a power play goal at 2:24 of overtime to hand the Carolina Hurricanes their second loss of the season in as many nights. The Capitals have won their last 10 home openers. They did so Saturday night in front of 18,506 red-clad devotees, the Caps’ 107th consecutive sellout. 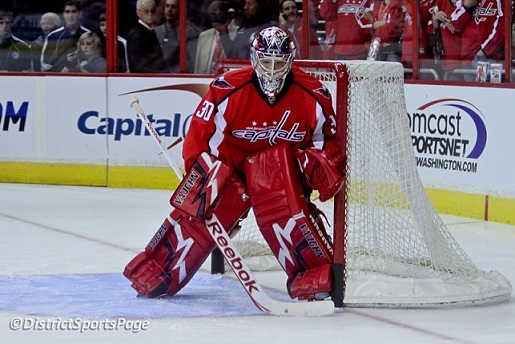 The Capitals led this game at 2-1 and 3-2, only to see it tied again on both occasions. The ‘Canes tallied with 1:19 remaining in the third period to force overtime, less than two minutes after Brooks Laich banged home an Alex Ovechkin shot off the back boards for their first power play goal. The second power play goal — the game-winner by Green on his only shot on goal — came with the Caps playing 4-on-3 in the overtime. Dennis Wideman fumbled a pass from Green a bit, which drew Carolina forward Tim Brent to the center of the ice. Wideman quickly recovered and found Green, all alone now, just above the right circle. His blast deflected off a shin pad and trickled through goalie Brian Boucher (32 saves on 36 shots) and the building erupted. The Caps’ most effective line Saturday night was the third line of Jason Chimera, Brooks Laich and Joel ward, often playing against the Hurricanes’ top line, featuring Eric Staal (two power play goals and an assist). One Capital who didn’t have a great game, despite springing Alexander Semin for one of the prettier breakaway goals you’ll every want to see, was defenseman John Carlson. He played a direct role in each of Carolina’s goals, sitting in the penalty box for the first two, then getting himself out of position on Jussi Jokinen’s game-tying goal at 18:41 of the third. Michal Neuvirth was strong in goal, making 28 saves on 31 shots, but was stellar in the overtime, when the Caps were forced to play 3-on-4 for the first two minutes as a result of a boarding call against Semin as time expired, promoting a several minute melee. There was no injury on the play, but Semin could very well find himself missing a couple of games under new NHL discipline czar Brendan Shanahan’s watchful eye. All told, it was a gritty, gutsy two points, against a division opponent. They host another division opponent Monday in the Tampa Bay Lightning, who unceremoniously booted the Caps from the playoffs last season, sweeping them in the second round. No one in the locker room would admit to it being a revenge game, but you can bet the fans in the stands will want to see a little payback.